Well it’s a brand new week here in Seattle, WA, dear art lovers, and I hope this post finds you well. This week has been a busy one for me. I have placed nineteen limited edition print tin variations in my Etsy shop: https://www.etsy.com/shop/MelanieSinclairArt?ref=si_shop. I will make ten of each of these babies and then I will move on to other things. I have enjoyed working on these little beauties, even if I call them beauties myself! Any new project is a learning process. I started out with the idea that I would make the prints at home with my Canon ink jet printer, which is an awesome product, but for some reason I was having trouble with it, so I went to a big box print counter and had them print my images up for me. I was floored with how nicely they came out, and have vowed to get a laser jet printer as soon as I can, and in the meantime I will be heading back to big box to make my prints for me. I am very excited about these pieces. 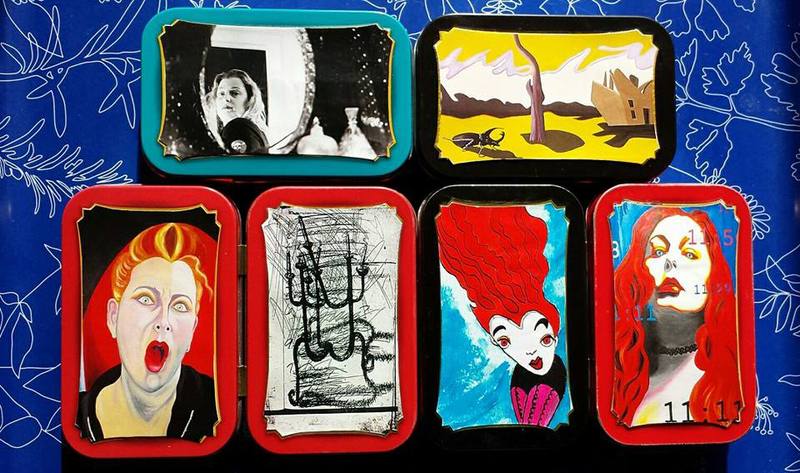 I have gone back in time and culled the very best from the last 14 years of my work and made print tins out of them. Relax, I have plenty of great art left to plunder for you, and I will make new images to share as well. I want to make my work accessible to many rather than an exclusive few. You can still purchase some of these as original pieces if you are so inclined: http://www.dailypaintworks.com/artists/melanie-sinclair-4232/artwork, though in some cases the original work has been destroyed or is in someones collection. Thanks, as always for reading my posts, I hope I help you become more out of the box creative.